When the divorce decree becomes finalized, your work isn’t over. In fact, when it comes to divorce planning for women, it’s just beginning. You might feel like you're free to move on with your life but the financial post-divorce reality is going to take a bit of effort. While divorce doesn’t directly impact your personal credit rating, your actions and those of your spouse can impact it. For example, if you have a joint credit card that your ex was supposed to be paying and they fail to pay. The non-payment negatively impacts your credit. While it isn’t the best case scenario, you may be the one who has to pay minimums just to keep your credit in good standing. Pull your credit report to make sure you’re addressing all outstanding accounts and balances. Most, if not all, should have been addressed in the divorce decree. After you’ve pulled your credit report, compare it to the divorce decree. There are likely accounts that you need to change to your name only or your ex needs to change. Creditors don’t know and don’t care if accounts are listed in the wrong name. They will come after you for payment if your name is listed on the account. Part of many divorce settlements is the splitting of retirement accounts. It may seem like a good idea to spend that money but it’s not. You want to have that money later when you actually retire. That money is designated as retirement and is taxed differently if you take it today versus when you are of eligible retirement age. Instead of spending, roll it over to a retirement investment account in your name only. 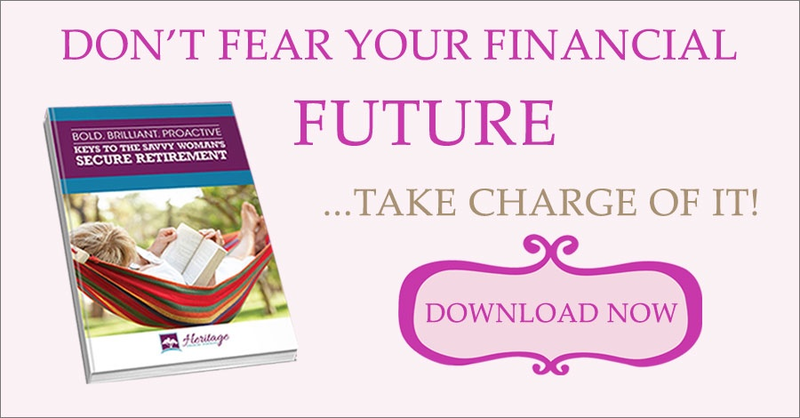 Just because you’re in transition doesn’t mean your financial future is on hold. Schedule a complimentary consultation with Heritage Financial Strategies today! If you're in the Gilbert area, join us at Second Saturday Divorce Workshop where we discuss divorce planning for women.